New proposals to tackle 'anti-social behaviour' appear to target homeless people in Manchester - leading to widespread anger. 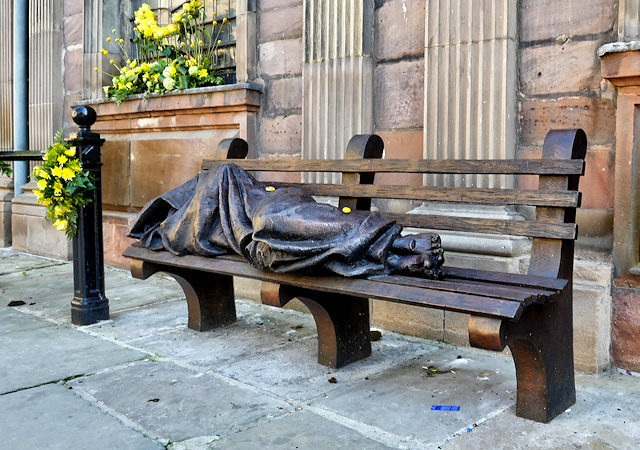 Pic: Sculpture of a homeless Jesus, unveiled last year outside St Ann’s church in Manchester. Rough sleepers in Manchester could be hit with £100 fines under proposals being put forward by the ruling Labour council. Under the proposals, authorised officers would be able to hand out new City Centre Public Space Protection Orders to individuals, to deal with ‘anti-social behaviour’. Those who refused to comply with the orders would be forced to pay £100. The council say there is ‘no proposal’ to prohibit rough sleeping or begging, and that the new orders will instead by handed to a ‘minority’ who commit anti-social behaviour. If the £100 fine for breaching a Protection Order is not paid, the proposals would see the individual taken to court and potentially being hit with a fine rising to £1,000, though it will not carry a jail sentence. “It’s so unfair – how are rough sleepers meant to pay a £100 fine, and where are they meant to go? I feel the council are trying to brush the issue under the carpet to move people on so they are not seen. Manchester Lib Dem leader John Leech said his party will ‘oppose it until the end of time’, and dubbed it ‘social cleansing’. The council says only those caught ‘aggressively’ begging will be hit with fines, but Leech said policies like this can and have been used as an excuse to ‘clean up the streets’. “Richard Leese, the leader of Manchester Council, described Christmas as “peak begging season”, the council claimed soup kitchens organised by communities and outreach teams are a “bad idea” whilst fining and trying to sue the homeless, spending £10,000 on one-way tickets to get rid of rough sleepers, refusing to build affordable and social housing and claiming the only way to tackle “offenders” is to fine them. “Whilst this city experiences the worst homeless crisis in decades, rather than tackling the causes, Labour in Manchester is investing in fines, court orders and inane policies that are so broad and lacking in detail that it can only be seen as an attempt to clean up the streets. “It’s essential that everyone is able to enjoy public spaces in our city centre which are safe and welcoming. Nobody should have to put with behaviour which has a negative impact on them or their environment. Manchester council has taken out a number of injunctions against homeless people living in tents across the city. The council’s proposal went out to consultation on Tuesday.